Once upon a time I fancied myself a decent fisherman, usually catching a fair number of trout in one of the many lakes, rivers, and streams of the Pacific Northwest. If you've been following my blog at all you know that since I moved down to the desert I haven't fared well in my fishing endeavors. Mainly, I think, because the primary game fish in these desert lakes are bass and catfish, and my experience with these species is limited. My primary location is Bartlett Lake, being only about a 45 minute drive from home. Bartlet is located in Tonto National Forest, and is not a true lake, but a reservoir created by the damming of the Verde River. I've spent significant time fishing this lake and the river with its many tributaries and landlocked ponds created by the fluctuating water levels. I started out using crankbaits after reading that they are the best bass lures around, but thus far I haven't caught a single fish with one. I don't really feel like I've quite got the retrieve down, and on top of that I keep losing them. I've reached a point now that I've practically given up on the crankbaits because not only do they not work for me, they are so damn expensive. In these waters, at least from shore, the plastic lures seem to work best; the slimy worms with the twirly tails, or the lizards or frogs. I'll drag one across the bottom slowly, jerking up every once in awhile to give an appearance of something alive. 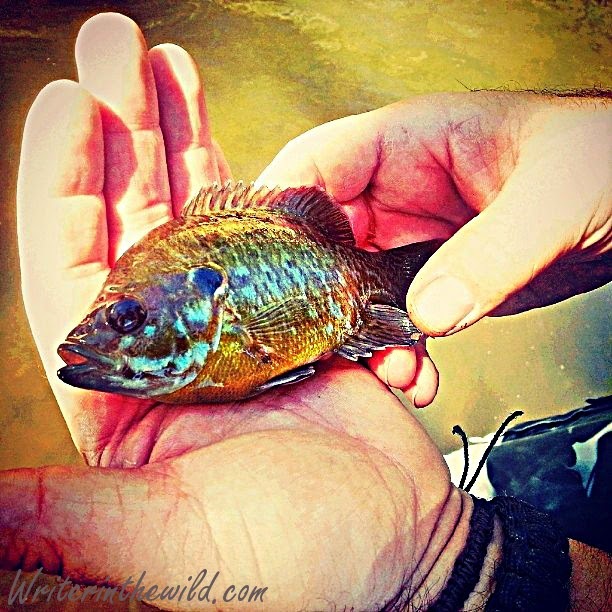 This method seems to work best for both the bass and bluegill, and my fishing buddies and I (well mainly my fishing buddies) have caught quite a few nice fish this way. My buddy Mike even caught a lunker largemouth at one of the ponds near the Verde that ended up on the Arizona Game and Fish website. Check out the photo HERE. My bad luck seemed to extend to my fishing gear as well. My trusty Shimano reel I've had for a few years now began suffering from some grinding gears, so I sent it in to Shimano for repairs. In the meantime I had a cheapie Zebco reel that unfortunately quit working the second time out with it. WIth two reels out for repair I purchased a third that seems to be holding up so far. Then, two trips ago my rod snapped in half while trying to negotiate a snag. Talk about a buzzkill. Nothing can ruin a trip faster then a snapped rod. 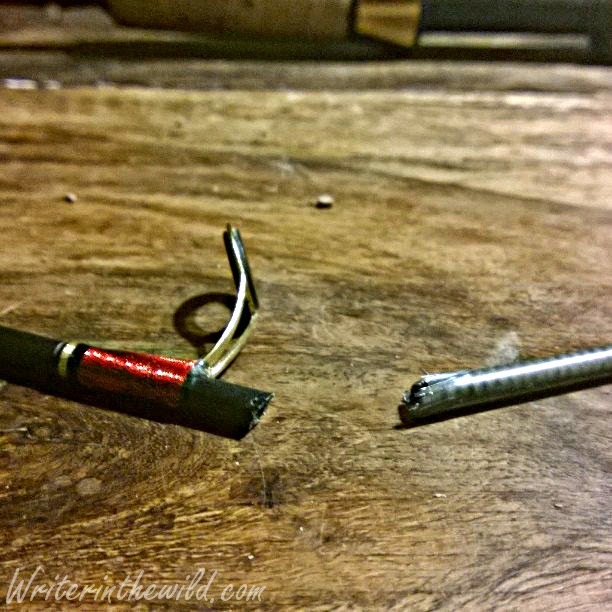 In the meantime I found an old Abu Garcia rod with a missing guide ring, that I repaired and took out last week. It's more of a trout pole than anything, but does the job well enough for now. With some help from my buddy Jimbo I've managed to try my hand fishing for catfish as well. I haven't caught one yet since I am currently borrowing equipment for the job, and am pretty new to it. Jimbo has caught a few using stink bait. I know there are some seriously big catfish in Bartlett Lake. In fact the biggest fish ever caught in the state of Arizona was a flathead catfish caught last year from Bartlett by a fella ironically called "Flathead Ed". It was nearly 77 pounds! Talk about a whopper! You can see Flathead Ed's monster catfish HERE. I've decided that once I get my bass fishing set-up back on track I'll start working toward some catfish gear. I would love to catch a fish that big. Although I haven't caught as many as my buddies, I still enjoy spending my days out in the desert. I feel like I'm on track to becoming a better angler, but just being outside is fun in itself. Hopefully I'll have some real success stories to write about in the future... Until next time.